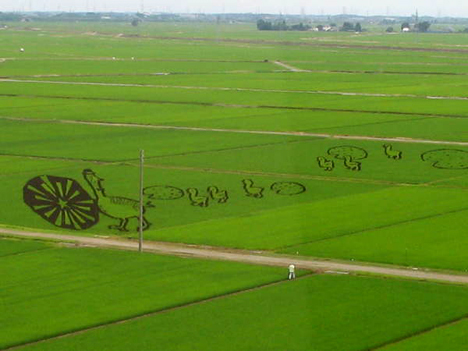 As summer progresses, crops of rice paddy art are beginning to emerge in Japan. 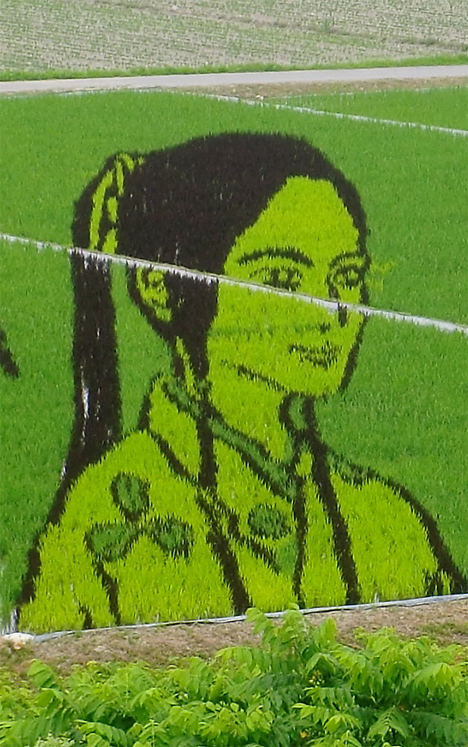 The crop art -- created by strategically arranging and growing different colors of rice plants -- can be seen in farming communities across the country. 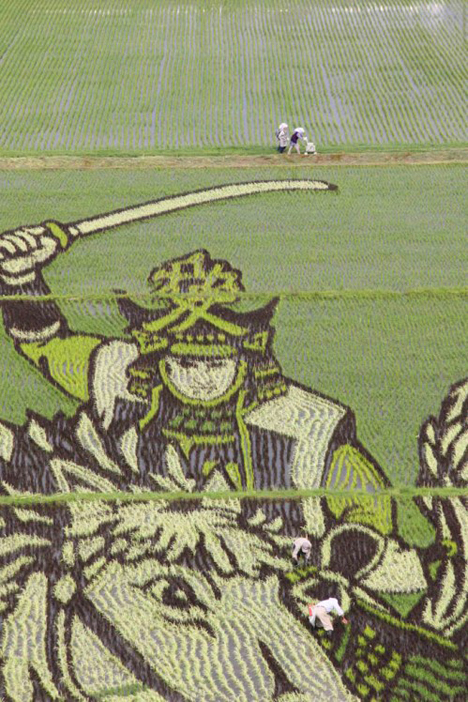 The largest and finest work is grown in the Aomori prefecture village of Inakadate, which has earned a reputation for its agricultural artistry. 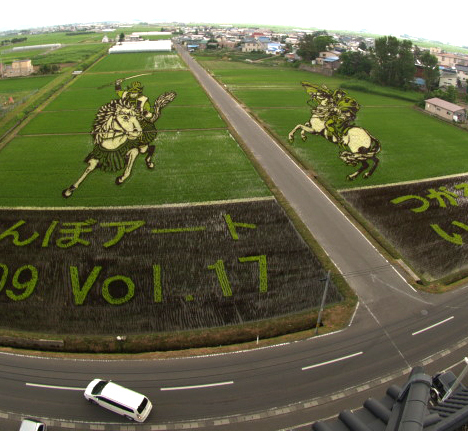 This year the enormous pictures of Napoleon and a Sengoku-period warrior, both on horseback, are visible in a pair of fields adjacent to the town hall there. 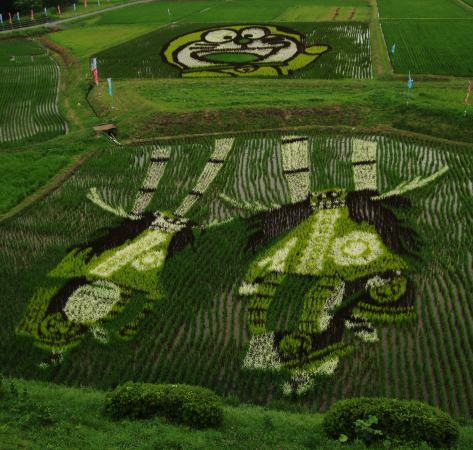 Another relatively famous rice paddy art venue is located in the town of Yonezawa in Yamagata prefecture. This year's work depicts the 16th-century samurai Naoe Kanetsugu and his wife, Osen, whose lives are chronicled in Tenchijin, the popular, year-long historical fiction television series now airing on NHK. 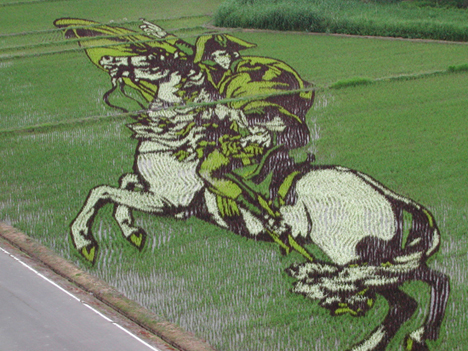 Smaller works of crop art can be seen in other rice-farming areas of Japan. Here are a few more examples. Ah, I love the ducks for some reason. Random! 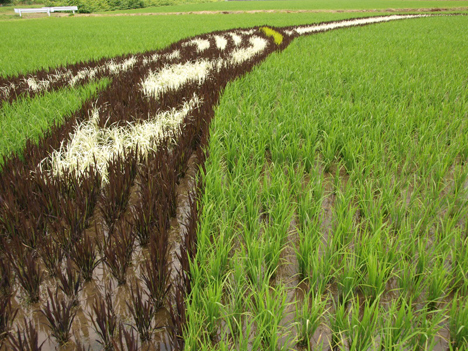 How do they harvest the different coloured types of rice I wonder. Only the Japanese could create such precision and Art. I am trying to m ake origami cranes and origami and Ikebana are other forms of precision Art forms. 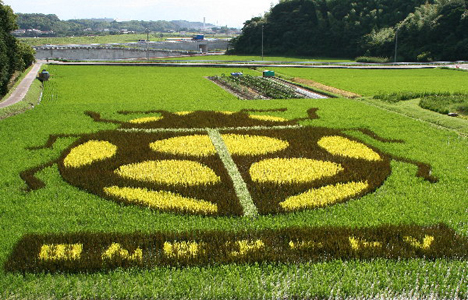 So much nicer than crop circles, so much less destructive and costly to the farmers. More than the crop circles, the droves of people who just walk out into the fields and break crops even more to get a look at things or to "test for aliens" or wtf ever they think they're doing, those people ruin farmers crops and livelyhoods. 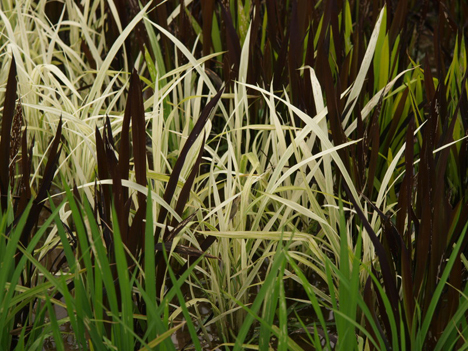 This, on the other hand, not only discourages monocropping but is beautiful and non-destructive to the farmers fields and livelyhoods. Great stuff. Who plots it out, the farmers? This takes some serious skill. Mucho props to them! Thanks for this. It's so beautiful, it made my day. More like much crops... snicker. OMG! Ok, I have a hard time keeping 4 tomato plants alive. This is awesome. Wish i had known about this when I was in Japan!! I have one rice plant on my shelf in the kitchen. Is it possible to create any of these gigantic illustrations with it? Surely you jest - you can't be serious unless you are monumentally deluded! Very beautiful,and creative. 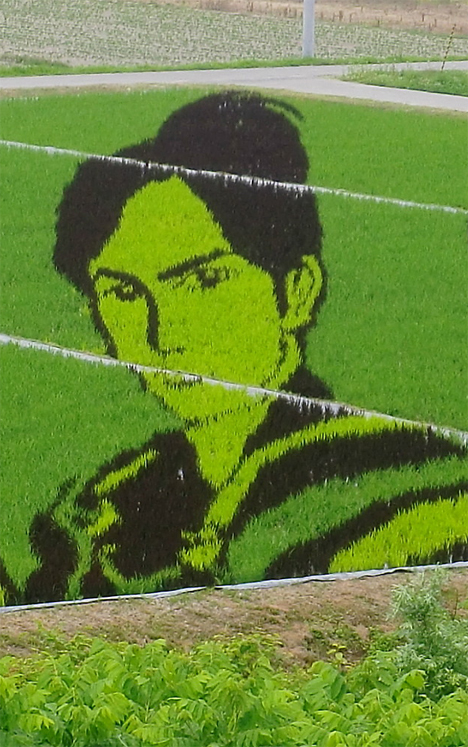 Wish there were more agricultural artists to improve all countries while providing food as well. Isn't the Sengoku-period warrior in the first picture Kanetsugu?? His armor (esp his helmet) looks very similar to Kanetsugu's armor. 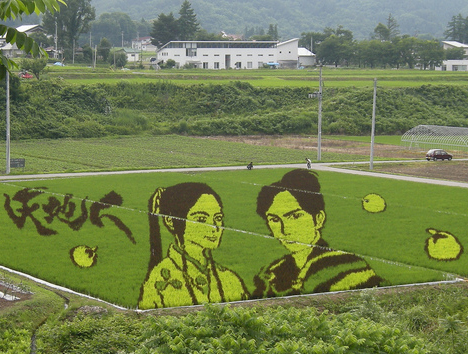 Absolutely fantastic rice art!I always been impressed by the Japanese art. 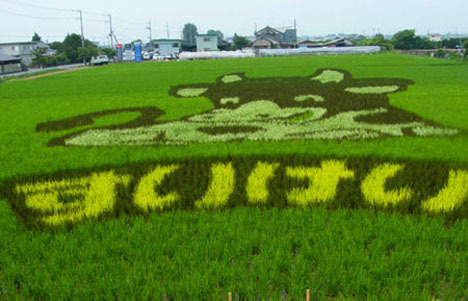 Awesome , fantastic Japanese rice art! Yes, The 'Sengoku warrior' IS Kanetsugu. 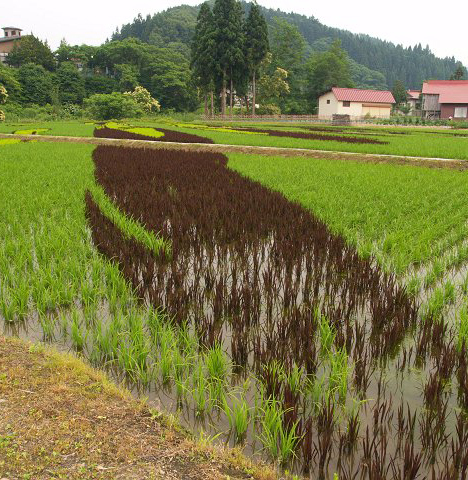 The other ricefield pictures of him are in Yonezawa, the 'next town over' from Yamagata city, where I live. Seeing these posted and getting attention abroad lets me feel proud of this amazing production here. But the odd thing is, I didn't see much about it at all in the local press, haven't heard it talked about at all. Strange. We need to see more GOOD NEWS like this get attention!! Inspirational. It's amazing what a dream will lead to when it is followed. Nice photos. 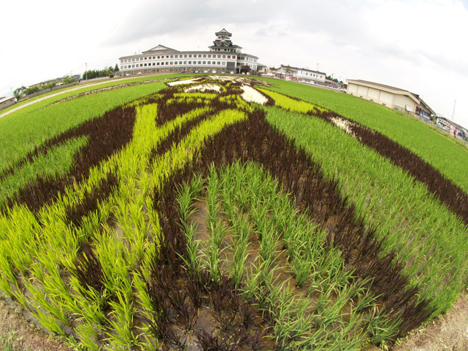 Here is an exclusive interview for those produced Japanese rice paddy art. ??????? ?? ??????? ????? | ??-??-??! Anime Diet » The Japanese is from Outer Space. Meanwhile, on the Internet… // VOID-STAR.NET ? 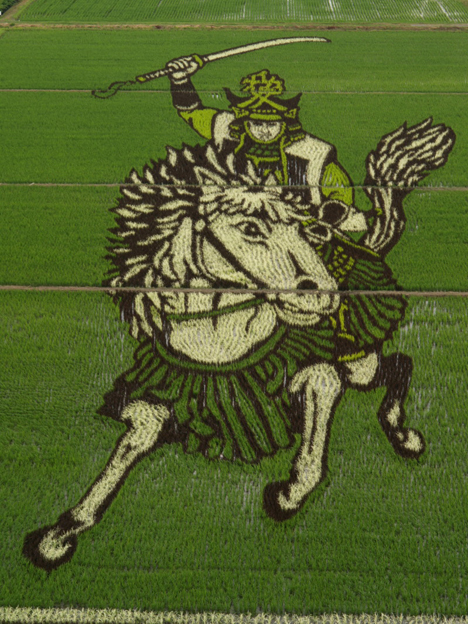 Fun Link Friday: Rice Field Art « What can I do with a B.A. in Japanese Studies?